Today some of my colleagues took the plane to Atlante to participate the Microsoft Convergence 2011 that starts tomorrow. I hope they have a great time, bring back great stories and some goodies for me 😉 You can check Christof and Youri‘s blog (AX EP Clipboard) for some regarding the Enterptite Portal sessions. 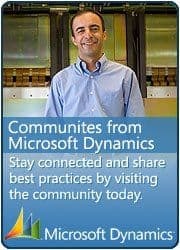 Or follow @MSFTDynamicsERP on Twitter. Decisions Spring 2011 is a FREE virtual event from MSDynamicsWorld.com. It follows on the heels of the highly successful Decisions Fall 2010, which ran last November and had over 3,500 attendees.